Gazing southeast, the sun rises slowly but surely over the horizon. The Seomjingang River’s pristine waters reflect the morning light and draws the eyes, meandering through the mountain ranges of the Jeollanam-do and Gyeongsangnam-do provinces. Another beautiful day begins in Hadong. Hadong, Gyeongsangnam-do’s westernmost county, has a wide variety of offerings to those who seek it. Nestled between Jirisan Mountain and the Seomjingang River, Hadong has a beautiful mix of water, plains and mountainous terrain. From this picturesque landscape comes an abundance of sights, smells, textures and flavors to satisfy the senses and soothe the soul. This, along with the friendly people and a laid-back countryside atmosphere makes Hadong a place where you’ll definitely want to take it slow. Also known as the Korean Alps, Hadong’s diverse terrain has something for everyone all year round. The warmth of spring brings a wide variety of flowers in the region. Visitors flock to stroll among the colorful blossoms and take in their fragrance. For the more adventurous, majestic Jirisan and the surrounding peaks make for great places to hike and explore. Autumn and winter are particularly beautiful in these mountains, bringing fiery colors and sparkling white vistas, respectively. The rice fields of Pyeongsa-ri and Agyang plain turn from striking green to golden yellow hues during harvest time. 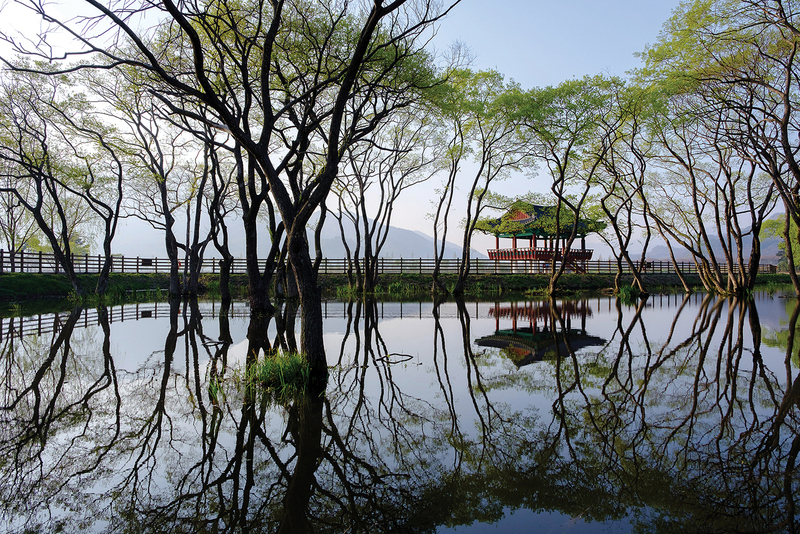 Pine trees are reflected on the pristine waters of Dongjeong Lake on the Agyang Plain. While Boseong and Jeju maybe the first places that come to mind when it comes to Korean green tea, Hadong was actually the nation’s first tea producer. Hadong green tea is wild, dating back over a thousand years ago to the Silla kingdom where monks planted the Chinese tea plants around temple areas. The wild tea spread to other areas in Hwagae and Agyang-myeon, and can be found growing in the valleys to this day. Even in this era of modern machinery, Hadong prides itself on producing high-grade teas using time-honored and traditional processing methods. 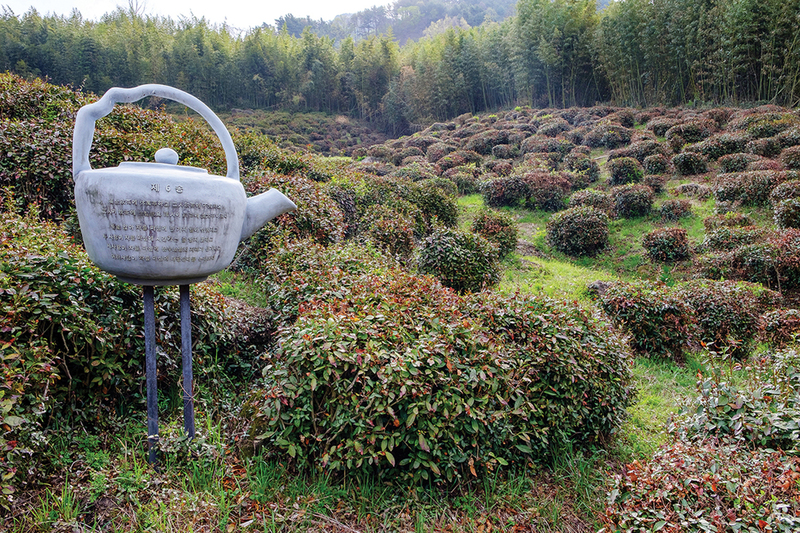 Green tea is celebrated at plantations and museums around the county, such as the Maeam Tea Culture Museum and the Hadong Tea Culture Center. There are also numerous teahouses along the road to Ssangyesa Temple that offer green tea products and experiences. The biggest green tea celebration, however, happens during the Hadong Wild Tea Cultural Festival every May. Festival participants can get a taste of Hadong’s green tea culture through hands-on experiences, musical performances and more. One particularly interesting place to experience Hadong’s tea culture is a restaurant called Magic of Tea Leaf. 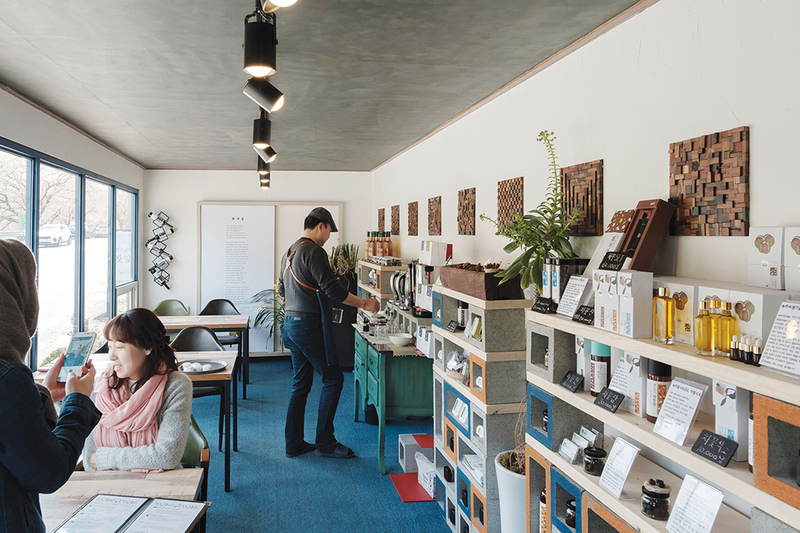 Located in Hwagae-myeon across from Ssangyesa Temple’s entrance, Magic of Tea Leaf serves up tea in very creative ways. Meals typically start with tea seed oil, honey and green tea flower wine. Unique side dishes include green tea Korean pancakes, green tea apple pickles, and green tea sauces. Their most popular dishes include steamed samgyeopsal topped with fried green tea leaves and the crunchy fried acorn jelly bibimbap. If you’re just looking for a nice cup of tea, they also have a tea lounge with a great view of the Hwagae Valley. Though Hadong is filled with old-world charm, places like Magic of Tea Leaf add a refreshing, modern twist to the countryside landscape. Wild tea plants grow abundantly in the Hwagae Valley. Strolling through the market, the song seems to speak the truth. Here you will find stall after stall of every Korean mountain root and herb imaginable. Browse a bit more and you will find fish, seafood and agricultural products from the surrounding region, as well as restaurants serving local delicacies and, of course, green tea. Other products such as ceramics, cookware, trinkets and handmade tools are also in abundance. 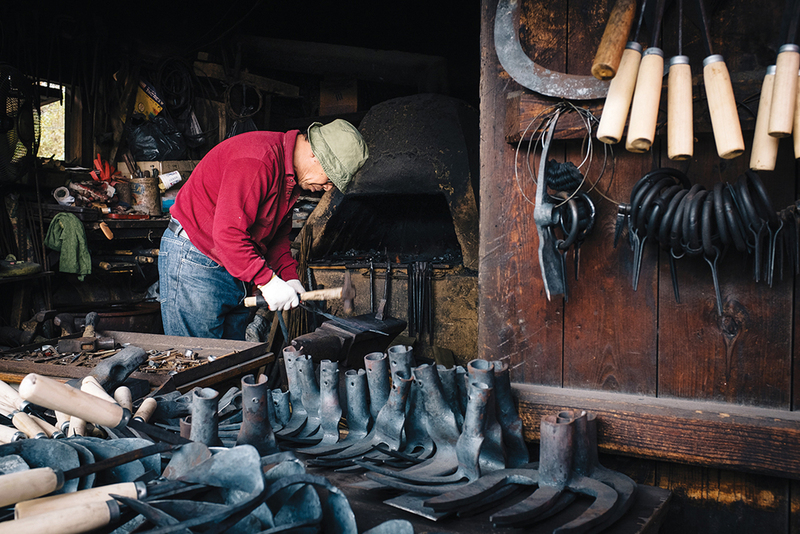 One particularly interesting part of the market to this writer is the blacksmith’s shop, whose master craftsman has been making tools by hand for decades. Every spring, Hwagae becomes even more charming as the cherry blossoms turn the surrounding landscape into a snowy white. The road from Hwagae Market to Ssangyesa is known as the Simni Cherry Blossom Road. This dreamy stretch of road is lined with the the delicate trees that signal that spring has indeed arrived. A blacksmith makes tools by hand at Hwagae Market. Past the cherry blossom trees and the wild green tea fields along the Simni road, you will find the ancient temple of Ssangyesa. The temple was founded in the year 722 by Sambeop and Daebi, disciples of the great scholar-monk Uisang. According to legend, the two disciples were guided to this location by a Jiri mountain spirit, who took the form of a tiger. The name “Ssanggyesa” means twin-stream monastery. Notable treasures in the temple include the enshrined remains of Yuckcho, a patriarch of Zen Buddhism, as well as a monument dedicated to meditation master Jingam, also known as Republic of Korea National Treasure number 47. Ssangyesa is also a central figure in the history of tea in Korea. One story says that the monk Jingam brought tea plant seeds back after returning from his studies in China. He planted the seeds around the temple and in the foothills of Jiri mountain, which resulted in the beginning of tea production in South Korea. There are several different stories regarding the actual events that took place, but there is no doubt that the Korean tea tradition is literally rooted in the fertile land around Ssangyesa Temple. 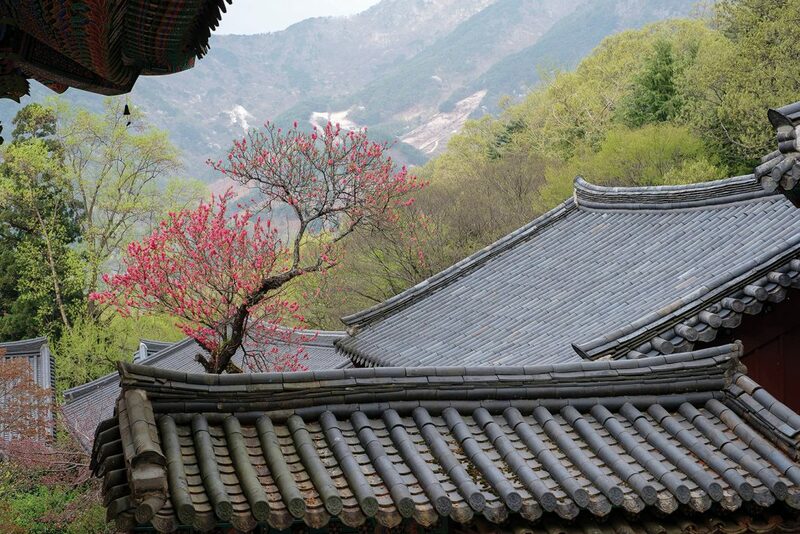 Two monks enjoy spring at Hwaeomsa Temple in neighboring Gurye. A few hundred meters from the Hwagae Market, one can cross the border into the next county and the next province. Jeollanam-do’s Gurye County, Hadong’s neighbor to the northeast, is similarly alluring. Despite being in another province altogether with a different dialect, Gurye’s proximity to Hadong makes it an essential part of any trip to this area. This farming town also has its share of attractions, one of which is the the annual Sansuyu Festival. This spring flower festival celebrates the bright yellow sansuyu, or cornus fruit that grows all over the province. 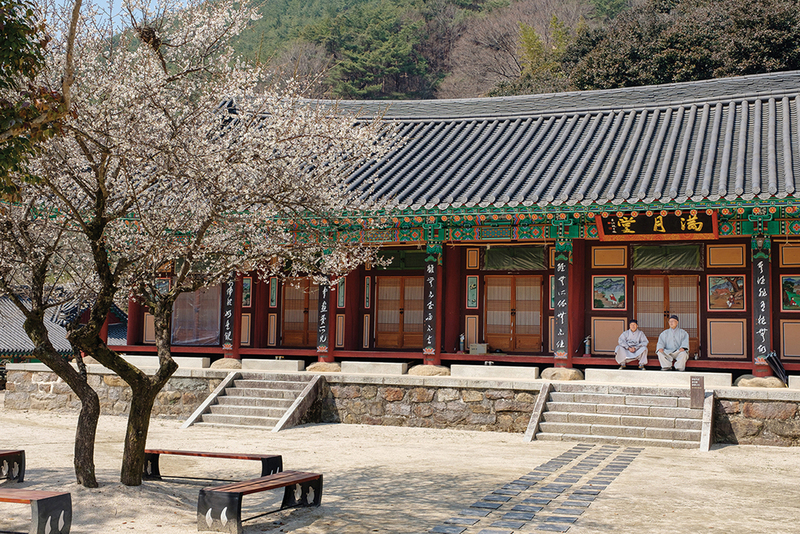 Gurye is also home to the picturesque temples of Hwaeomsa and Cheon-Eunsa, both wonderful places where Korean spirituality and tranquility are exemplified. Afternoon tea is prepared at Magic of Tea Leaf’s tea lounge. Hadong has a wide range of accommodations, from resort hotels to pensions, motels and even temple stays. Hadong’s countryside location does not make it any less accessible to online booking sites, making it very convenient for travelers. Hadong’s local specialty is jaecheop, freshwater clams. There are jaecheop restaurants all over Hadong serving the popular jaecheopguk soup or jaecheophoe salad. Also try Magic of Tea Leaf in Hwagae-myeon, which serves unique, tea infused dishes. The intercity bus from Nambu Terminal will take you to Hwagae Terminal in Hadong. From there, taxis and buses will be available, but the best exploration is done on foot.